The Hizbullah terror organization on Thursday denied involvement in this week's bombing of a tourist bus in Bulgaria that left at least five Israelis dead and dozens more wounded. Israeli officials have vowed to the avenge their dead saying they plan to "settle the account," while Prime Minister Binyamin Netanyahu pointedly accused Iran and Hizbullah of perpetrating Wednesday's attack. “For over a year, Iran, along with its protégé Hizbullah, has been waging an international terror campaign,” Netanyahu said on Thursday. He called Iran “the world’s No. 1 exporter of terror” and Hizbullah its “long arm". “We will not seek revenge over the death of Imad Mughniyah by harming tourists,” a Hizbullah spokesman told Lebanese media channels last night. Mughniyah, once Hizbullah’s top military commander, was assassinated in a car-bomb explosion in Damascus in February 2008. 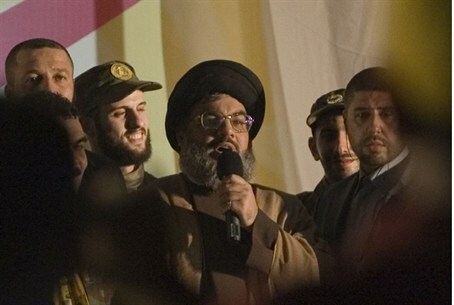 Hizbullah blamed Israel for Mughniyah’s killing and vowed to take revenge. Still, Israel’s accusations are based on a series of foiled or bungled bomb and assassination plots over the past two years that have spanned the globe, from India to Turkey, Azerbaijan, Thailand, Georgia, Kenya, and Cyprus. Some of the perpetrators who planned those bungled attacks have been linked to Iran and to Hizbullah, called the "A-Team of terrorism" by some US officials. Israel and Iran are currently at dagger points over Iran's controversial nuclear program, which Jerusalem says is dedicated to developing nuclear weapons that would pose an existential threat to the Jewish state. Several Iranian scientists involved with Iran’s nuclear program have been murdered in the past two years, and computers at Iranian nuclear facilities have been struck by highly sophisticated viruses. Iran has accused Israel of the assassinations and cyber attacks, leading analysts to suggest Tehran is seeking to effect a form of deterrence through covert attacks of its own against vulnerable Israeli targets. It is widely believed Hizbullah, which has an international reach and provides a layer of deniability to Iran, is a part of that effort. From Hizbullah’s perspective, avenging Mughniyah requires selecting a target with reciprocal value, such as a high-profile political or military figure in Israel. However, the terror group has yet to do so. One reason is the likelihood that such a move would spark another highly destructive war between Hizbullah and Israel, which would cost the terror organization dearly in the polls. Beirut's current government is dominated by Hizbullah, but there is sharp and mounting criticism in Lebanon that its unilateral foreign policy vis-a-vis Israel is a danger to the country and its economy. But most observers say Hizbullah is merely biding its time. A month after Israeli helicopter gunships killed Hizbullah leader Sheikh Abbas Mussawi in February 1992, the Israeli embassy in Buenos Aires, Argentina, was blown up, killing 29 people. Two years later, a Jewish center also in Buenos Aires was destroyed in a bomb blast that left 85 people dead. The bombing came six weeks after Israeli jets and helicopters killed more than 40 Hizbullah recruits at a training camp in eastern Lebanon. Several senior members of Iran's foreign covert operations Quds force, which has long-established ties to Hizbullah, were implicated in that attack. Previously, in the 1980s, Hizbullah carried out massive bomb attacks against US Marines in Lebanon and twice against the American embassy in Beirut. Those attacks collectively left more than 300 people dead.